With circuit protection of breaking for motor, once any wire of three phases power source is broken off, this unit could cut off current to motor to prevent motor from being burn out. Drill sleeves, tapping adaptors and borer holder are all with rapid adaptors, very convenient for replacement of cutters. Tapping adaptors with torsion control, tap bits are protected from being twisted off. 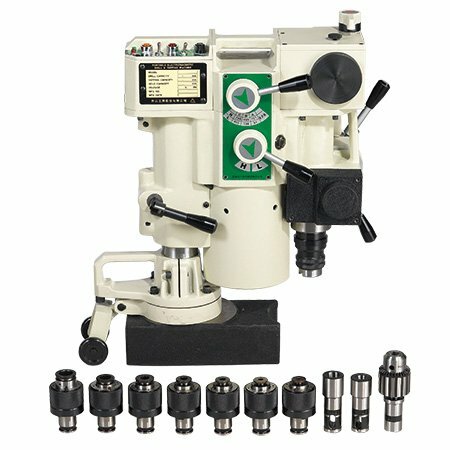 When drill bit is worn out, this unit will drive feeding intermittently or stop feeding, Once feeding becomes difficult while making a hole, please replace a new drill bit or re-sharpen the worn out one in order to protect both drilling tool and machine body from being damaged. Choose different feeding rates according to different drill bits and material to perform Auto-Feeding operation. This device can break chips intermittently and discharge them while Auto-feeding is processing, so that chips would not roll on drill bit, Easier to discharge chips. Feeding rates are separately 0, 0.15 and 0.25, please choose suitable rate according to size of drill bit and material of work-piece for drilling. * 3-Phase 380V, 415V, 440V, Are Available for Requirements of Customers.